“Keltie” picked up her first JAM in a Derby held at San Jose R.C. Field Trial, on 5/12/2007 at Denverton Road. She held on and managed to complete a total of six series. Normally there is four. However, along the way one test set up was scratched due to several dogs being unable to find the birds. Keltie was one of three dogs who ran that test that found the birds. Ugly as it was. The Judges set up 4 water series and 2 land series and I was very proud of Keltie’s efforts throughout. If a golden JAMS or Places in Derby they carry two stars at the end of their name to show this accomplishment. I am very happy both girls did so well in their very short Derby careers and carry two stars. Now we are back in to Hunt Tests and possibly Quals as time moves on. “Shuttle” and Diane went to their very first Derby held by NorCal , 5/20/2007 held at Denverton Road. It is with great pride I announce little “Shuttle” showed everyone there how the golden girls can and do well up against the Professionally trained dogs running. Completing all the series and receiving a JAM for her good work! Yippee! When I say Professionally trained I mean dogs who have been in kennels since forcing and go home occasionally. “Shuttle” enjoys her home life and working together with Diane. Early on Diane and I discussed her options with “Shuttle’s” field career. One of the topics that was discussed was sending “Shuttle” to a Pro for in-house training. We discussed the Pros (no pun intended) and the cons of doing this. I am glad Diane opted to continue working with “Shuttle” herself. This is quite a team. “Shuttle” snuggles at night with Diane, and works for her with focus and a willingness that is a wonderful sight to behold. Congratulations to you both. Diane continues to work hard with “Shuttle, practising drills and marks almost daily. Diane’s hard work and “Shuttle’s ” talent and trainability are paying off! “Keeper” and Chris finished their Senior Hunter Title on May 4th, 2007 at the Sierra Nevada Retriever Club Hunt Test. The test was held in Fallon, Nevada. “Keeper” was entered in the Senior tests both days. He did his Mom’s and Me proud. Running beautifully, receiving applause from all of us in the Gallery. He earned his Title and an extra leg with lots of style. Chris did an exceptional job of Handling “Keeper”. I cannot express how supremely proud of them I am. These two have journeyed with me through thick and thin to attain the title. “Keeper” is my first client dog to attain a Senior Hunter title. Both Chris and Keeper will be moving forward in to Master in the not to distant future. “Chili” and Kathy took the trip down South to the Toller Specialty too. The test “Chili” and Kathy entered was the Basic Retriever Test (BRT) for tollers. “Chili” passed with flying colors. Which then made it easy to decide they were ready to try the WC test for tollers at the NorCal GRC WC/WCX test held June 2nd, 2007. I am proud to announce they passed the WC with great style. When I met “Chili” and Kathy in 2006 he was a young puppy. He showed a great deal of promise. We spent our time introducing “Chili” to birds, retrieving and marking concepts in the earl days. However, we felt at some point he needed a break from field to mature out and off they went to pick up some obedience and agility titles. Apparently the time away from field did no damage. Since “Chili” has matured his return to field work shows nothing but positive results. Congratulations to you both on your recent success. A cute sideline at the NorCal WC/WCX awards ceremony Kathy and “Chili” sat in front of me. Each time I applauded “Chili” would turn around and look at me and pull toward me. I almost thought he would pull Kathy right off her chair. Tollers as a breed are known for their stand offish personality if you are not in their Pack. I felt very honored “Chili” still felt I am a member of his elite pack after time away from me. “Venture” and Linda took a trip down South to the Toller Specialty 4/28/2007-4/29/2007, the field events were held at Prado Dog Training Area. “Venture” was entered in the WC both days as an insurance to come home titled. Saturday, temperatures were in the high 80’s. After successfully completing the land series “Venture”headed to the water series. By the time they reached the endless line of holding blinds it was a test to see who wanted to get in the water more. Linda or “Venture”? As required part of the tolling WC test a toller must perform a tolling tests with an object other than a bird at the waters edge prior to doing his retrieve for a mark with ducks. During this process the gunners for the marks are out at their stations. “Venture” was quite appalled that he would have to toll first and insisted on letting Linda know this was not the way he would run this part of the test by circling her in the holding blind several times before commencing on to his tolling 4 times successfully. Nothing says the tollers can’t have an opinion! “Venture” then went on to successfully complete his water marks and receive his title of WC. For good measure “Venture” also completed the next days test. Their plans are to go on and try for a Junior Hunter title next. Congratulations to you both. I am very proud to have helped you accomplish your goals so far. “Blaze” earned her 3rd Master Hunter leg at the Sierra Nevada Retriever Club Hunt test. Under the infamous Russ and Stacy Reavis team. She gave her all for this leg. I did too! It was so nice to have the teamwork needed at this level and enjoy our victory together! “Flyer” living up to her name flew though two Senior Hunter tests picking up two legs toward her title at the recent Sierra Nevada Retriever Club Hunt Tests. This fast stylish little golden worked well with her handler and awed the Judges with her talent and speed. Congratulations to you both! “Keltie” received a Senior Hunter pass at the recent Sierra Nevada Hunt Test making it a total of 3 Senior Hunter legs to date. Just one more for a title. “Keltie” and I are embarrassed to admit to some recent failures in Senior that are direct result of focusing on Derby, and forgetting to practise handling drills and blinds regularly. We plan on pulling our socks up now, and buckling down to get that last leg. I share this with all of you to assure you that indeed I fail too. I am human. For those of you who dwell on the failures at tests I can only say DON’T. Most of you have a good idea why you failed. Sometimes stuff happens, sometimes you aren’t putting in the time. You have to decide what needs to be done. If anything. “Fire Truck” earned his first Junior Hunter leg at the Sierra Nevada Hunt Test and picked up his second Junior Hunter leg at the Marin Retriever Club Test. I am very proud of Fire Truck who came to me some time ago and has developed very nicely with Xan faithfully attending classes and working on training Fire Truck has shown us he can play this game and be succesfull! When Xan came to me to help Fire Truck with his field training I couldn’t help noticing another black dog in her vehicle. I was curious why we weren’t doing both the dogs. Xan explained “Leila” was an agility dog and was probably not a good candidate for field trainng. I asked if we couldn’t just see what she thought before deciding. Xan agreed. It was very apparent “Leila” was a high drive girl who also loved the retrieving game. We decided to include “Leila” in training too. I am very proud to say she also earned her 1st Junior Hunter leg at Sierra Nevada Hunt Test and her second at the Marin Retriever Club Hunt Test. “Leila” is continuing training and showing a lot of potential to move forward in to Senior. I am glad I am a nosey person and asked to try out “Leila” in field too. She is having a ball! Xan gets to handle two dogs in tests which she is managing beautifully. 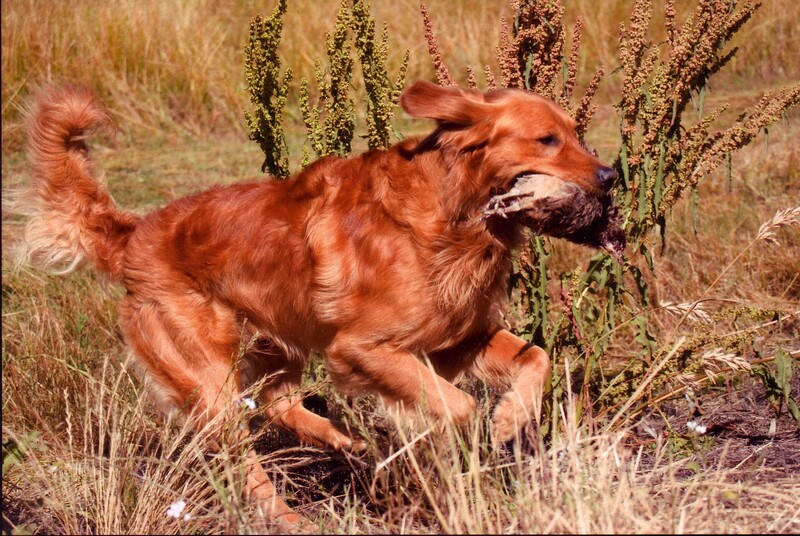 “Sporty” picked up her second Junior Hunter leg at the Sierra Nevada Retriever Club. I am very happy that “Sporty” shows all the desire and drive she does. Christine has worked hard to accomplish her goals with “Sporty” and both have come a long way since the first time we met. Congratulations to you both! Looking forward to hearing more good news soon. “Finn” and Suzanne took a trip to Puget Sound to visit friends and decided to enter a hunt test held by the Puget Sound Labrador Retriever Club Hunt Test near Seattle. “Finn” scores were 9’s and 10’s across the board and he had an exceptional day earning his first JH leg. He then went on to complete another JH leg at the Marin Retriever Clubs test in Oroville. Hurray! Half way there now! Remembering my first encounter with “Finn” and Suzanne, it’s only fair to say Suzanne and “Finn” have worked hard at changing old habits, and learning new ones. Safe to say. We’ve come a long way Baby! Thanks to “Finn’s high trainablity level. Congratulations to you both! Super proud of you! 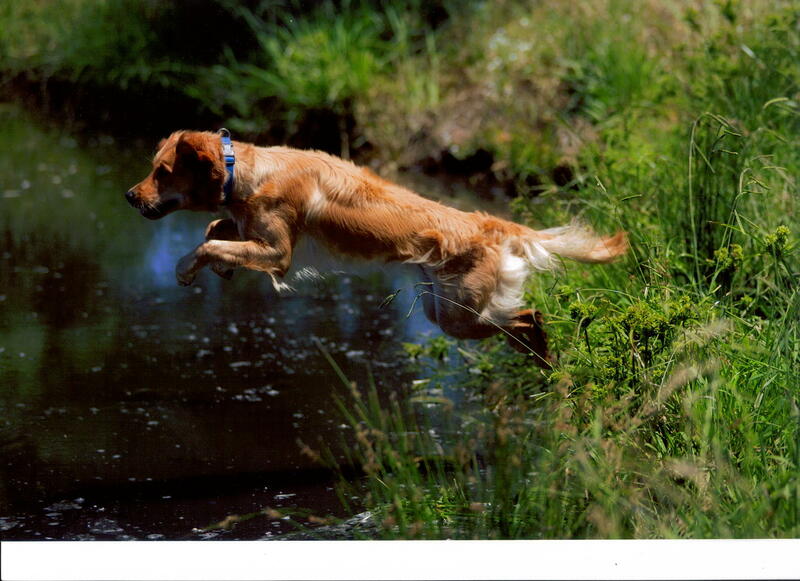 “Casino” earned his third JH leg at the Marin Retriever Club. Keli came to me several months ago asking if I could take a look at “Casino”. A beautiful male flat coat, with a strong personality. He had got two JH legs some time ago. Keli wanted to get the last 2 legs and was having difficulty succeeding. “Casino” just couldn’t seem to mark when we first met. That has changed considerably. We worked dilligently through different marking drills to help develop “Casino’s” marking. I am proud to say that Keli worked hard at home with her family of throwers, to perfect “Casino’s” marking skills. “Casino” apparently smacked all four marks in the test. Keli is a true testament of working hard with her dog to attain the goals she sets. Congratulations!!! 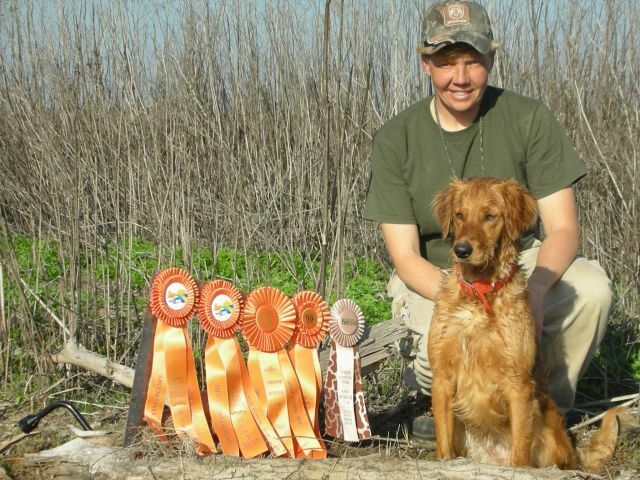 “Julia” at just 11 months old earned her first JH leg at the Marin Retriever Club Hunt Test. When I first met “Julia” she was a very busy little girl. So busy sometimes she just couldn’t hear her Momma Keli calling her to come. We took some time to teach “Julia” about whistle recalls and collar conditioned to recall on a whistle. Things started moving forward rapidly with Keli finishing up the force fetch part of Julia’s training at home. We continued to meet and work on basic marking concepts and stretching Julia out. It all came togehter beautifully. Keli was a very happy girl when I saw at the Marin test. I couldn’t have been happier for her. She is off to the Flatcoat Specialty where she hopes to pick up more ribbons. “Shad” and Jeanne have so far earned 3 JH legs toward her title. She is proving herself as a great little retriever along with being a much loved companion at the Collier Household. Congratulations to you both.